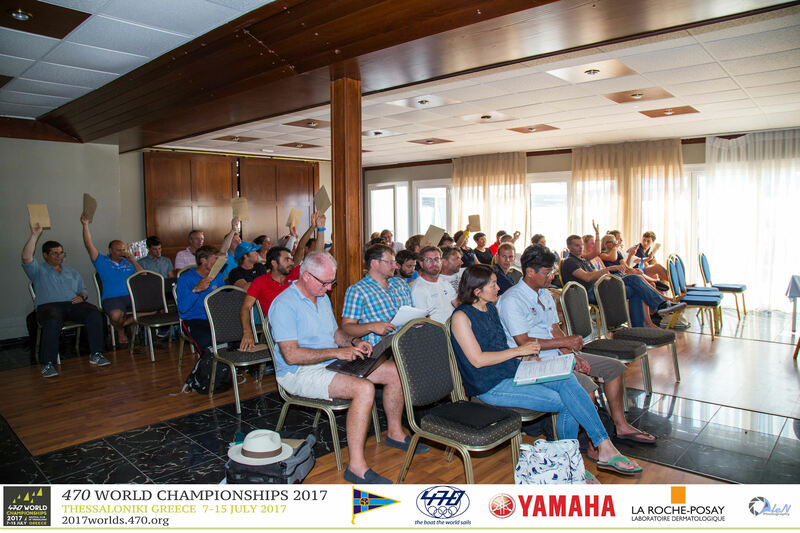 The 2017 General Assembly Meeting of the International 470 Class Association took place on Saturday 8 July 2017 at the Nautical Club of Thessaloniki, after the second day of measurement and registration. The representatives from thirty-two 470 National Class Associations took key decisions on the future of the 470 Class regarding the introduction of carbon masts, 2016 accounts, 2017 budget and approval of future Championship venues. Carbon Mast – Submission 01-17 was approved by the required two-thirds majority approving changes to the 470 Class Rules which allow the introduction of a 3-piece carbon mast. Linked with the 2024 Olympic Games, the earliest effective date will be September 2020, with masts available to teams well in advance of September. Aluminium masts can still be used, and use of the carbon mast at events will be controlled by the Notice of Race. It is expected to use the carbon mast for 470 Championships, World Cup events and other premier events. The mast and boat weight and centre of gravity limits are under consideration and the specification will be finalized at the latest within eighteen months. In respect of timeframe, making a decision so many years out will ensure comprehensive testing can be completed before the specification is finalized, a clear distribution and production plan can be implemented and teams will have plenty of time to use the carbon masts ahead of the introduction date for competition. To enable much improved distribution of the mast, making the 470 more accessible and able to be shipped in a 20ft container worldwide or taken on a plane as hold luggage. Approved carbon masts will last longer, and are not permanently bent out of shape as is the case with aluminium masts under heavy load, making 470 sailing more sustainable. A detailed specification with tighter tolerances can be enforced to ensure consistent characteristics from one mast to another. Teams will know that the mast they buy is the same as the other teams. Strict licensing will ensure there is no arms race and no team will be able to enjoy an advantage by having a special mast made by a builder which is not going to be available to other teams. You can read the full reasons for introduction within Submission 01-17 which details the Class Rule changes (which will be subject to final approval by World Sailing) and find out more in the Carbon Mast Questions & Answers. There is ongoing dialogue to confirm the future venues for the 470 African Championship, 470 North American Championship and 470 Oceania Championship. Finances – the accounts for the year ending 31 December 2016 were approved, as was the 2017 Budget. As part of the ongoing focus on developing 470 nations, an increased budget totalling EUR30,000 was approved for 2017 which will enable commitment to a range of projects including invitations and charter boat support to attend the 470 Championships, pre-Championship Clinics, provision of coaches to support teams at key events, creation of dedicated 470 training bases and dedicated training for Coaches.